With winter weather advisories issued across the state of Pennsylvania, at least value-seeking Northeast breeders can warm up to the intriguing stallion Alex's Pal (TrueNicks,SRO). After standing his first few seasons in Florida, the half brother to Successful Appeal (TrueNicks,SRO) has had a solid last 12 months, especially considering his modest $2,000 fee. With three crops to race, he has sired 31 winners from 65 named foals of racing age, and his progeny have earned more than $1.3 million on the track. Last year's headliner for Alex's Pal was $209K-earner C C's Pal, who placed in six stakes events, including the Florida Oaks (gr. III), Monmouth Oaks (gr. III), and Comely (gr. III). In the latter, she was just one length behind nice fillies by Tapit (TrueNicks,SRO) and Speightstown (TrueNicks,SRO). C C's Pal is out of a Noactor (by Theatrical) mare, making this a Valid Appeal/Nureyev cross. There are only 23 starters so far on the cross, but it has produced 2010 stakes winner Foreign Argument (by Closing Argument (TrueNicks,SRO) out of an Alwuhush mare) in addition to C C's Pal. Last week, Alex's Pal had three-year-old filly My Pal Chrisy run second in the Gasparilla Stakes at Tampa Bay Downs. My Pal Chrisy is bred similarly to Forward Gal (gr. 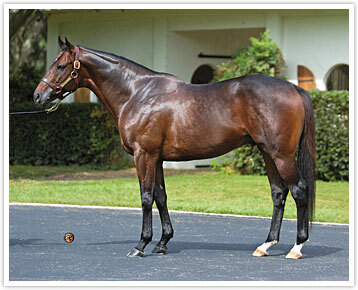 III) winner Miss Inquistive, as both are by sons of Valid Appeal and out of mares by Strike the Anvil. My Pal Chrisy is now the first runner to earn unrestricted black type under her first two dams, and she may point to the Florida Oaks for her next start. C C's Pal is one of 22 named foals in her crop, and My Pal Chrisy is one of only 13 in hers, making their stakes success an encouraging sign for Alex's Pal given the limited opportunity. 2011 will be Alex's Pal's first at standing at Pin Oak Lane Farm in New Freedom, Pennsylvania. Standing alongside Alex at the farm are Albert the Great (TrueNicks), Coastal Storm (TrueNicks), Invisible Ink (TrueNicks), and Lite the Fuse (TrueNicks). Breeders may want to consider Alex's older half brother Successful Appeal as a guide for potential matings, as both hail from the Valid Appeal sire line. Successful Appeal has sired three grade I winners in Appealing Zophie (dam by Hawkster), J P's Gusto (Caller I.D. ), and Succesful Affair (Storm Bird), plus the impressive Successful Dan (Wolf Power), who finished first in the Clark (gr. I) only to be DQ'd to third. All four horses rate A++ on TrueNicks, suggesting that similar crosses may be worth considering for Alex's Pal. Alex's Pal will stand for a $2,000 fee, or $1,000 for multiple mares.